With 20mm collar for all MICROMOT drilling and milling machines in operation with steel collets. 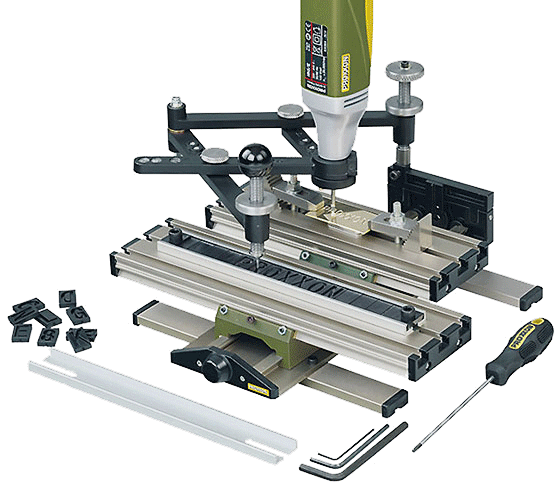 Professional drill/grinder IBS/E and clamping jaws are not included in the scope of delivery. 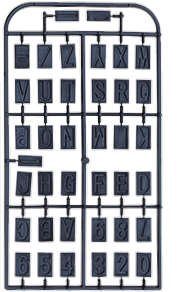 For engraving letters, numbers and individual shapes in metal, plastic, glass or stoneware. For name plates, jewellery or other objects of value. Also for working with self-made stencils or commercially available templates (plants, animals, coats of arms). For small size, individual shapes, cut-outs or outline shapes, even in series. A maximum of 14 characters can be fastened in the guide bar (template holder). Template contours are precisely to be followed using the guide marker (ball handle). The lettering to be milled is scaled down during transfer. The transfer ratio can be set to 2:1, 3:1, 4:1 or 5:1 by simple adjustment of two screws. 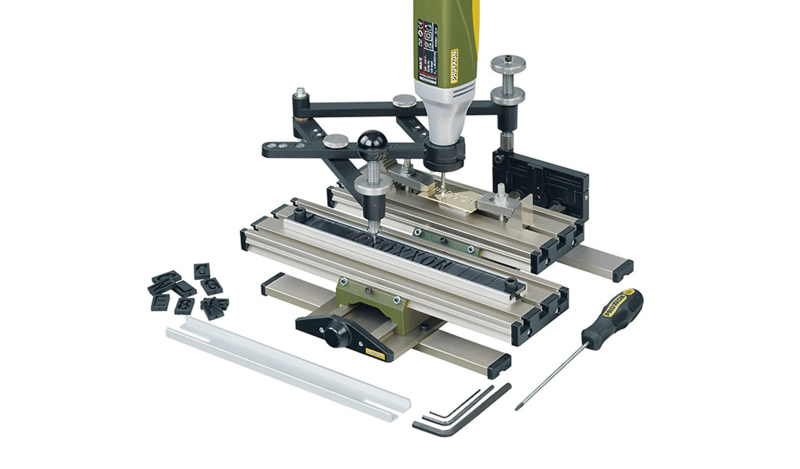 The work piece is aligned and fixed on the movable guide block by means of clamping jaws (here MICROMOT clamping jaws set NO 24 256) or using a vice. 2 sets of letters from A to Z, hyphen, full stop and dash (total 52 pieces), one each Allen key 1.5 - 3.0 and 5. 0mm as well as a HEX (ball head) screwdriver 2.5mm. Includes a detailed instruction manual. For machining steel, cast steel, non-ferrous metals, plastics, glass, stoneware and tiles. Nose angle 60° for high stability. Shaft diameter 3.2mm. Not suitable for freehand work. Letters A - Z, incl. hyphen, full stop and slash. Also numbers 0 - 9. For use with guide bar of the GE 20.